When critics want to dismiss Bernie Sanders's bid to be the Democratic presidential candidate in 2020, the say that he is too old and too white, and incapable of bringing young people and racialized people to the polls, the way that, say, Obama did in 2008 (after all, American politics is as much a contest of who votes and who doesn't as it about whom they vote for). The same people who say this often have other iron laws of Democratic policy, like "Democrats can't support Medicare for All" and "Democrats can't support a Green New Deal" and "Democrats shouldn't try to tax the rich." When they say this, they really mean "Establishment Democrats' big-money millionaire/billionaire donors won't back Democrats who support these policies," and so, despite the enormous popularity of these policies, the Democrats shouldn't run on them. Sanders favors all of these policies, and more, and so it's no surprise that his critics are grasping at (evidence-free) straws to neg him in the public sphere, but of course, reality has a well-known left-wing bias, so it's no surprise that they're (very, very) wrong. For example, Sanders is beating Kamala Harris 2-to-1 in polls of African American voters (possibly because Harris supported the preservation of forced prison labor, joked about her actions to jail parents whose kids were truant, and let Steve Mnuchin walk away from grotesque financial crimes that victimized poor people and stole their homes). And 18- and 19-year-old first-time voters are big on Sanders because his policies matter more to them than his age, especially his support for immediate, meaningful action on climate change -- even though Sanders will be dead before climate change makes most of the USA uninhabitable, these kids won't be, and they know it. Facts matter: Sanders's base is young and diverse, and the "Bernie Bro" is a myth. 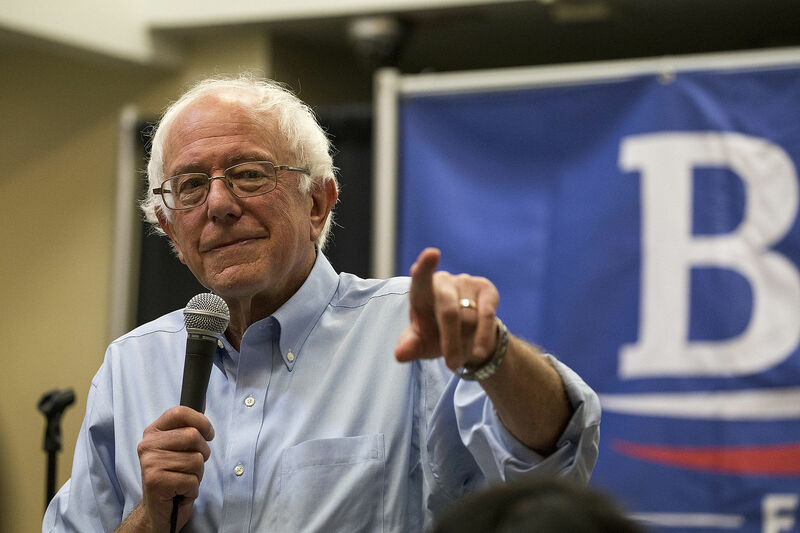 Sanders is more popular with racialized people than white people, as popular with women as he is with men, and is especially popular with young people. Sanders's critics don't want to engage with the substance of his policies, which are, foundationally, anti-capitalist, seeing markets as a tool to be deployed to solve some problems, not as the natural order or the arbiter of moral worthiness. This is a challenge to post-Reagan, Ayn-Rand-derived orthodoxy and it definitely makes some people deeply uncomfortable -- but not black and brown people, and not young people. I am a Sanders primary campaign donor, a member of the Democratic Socialists of America, and I donated to his 2016 campaign (I'm also a donor to Elizabeth Warren's primary campaign). Meanwhile, Freya Buhr, 19, of Clermont, Iowa, is so dedicated to Sanders that she didn't let the fact Friday was her birthday deter her from attending the Vermont senator's rally in Iowa City. "Bernie is great and he's always been on the right side of history," Buhr said when asked why she stands behind Sanders. She pointed to his work on civil rights as well as the senator's stance on LGBTQ rights and issues. "He's a strong leader," Buhr added. "He's the kind of person we need with the current political discourse in America." When asked if she agreed with critics who've suggested Sanders will struggle to win over women voters, Buhr referred to him as a "feminist" and said that "Bernie's platform has always been in support of women."